When an overturned truck blocked Highway 99 southbound, the evening commute in downtown Seattle was gridlocked. 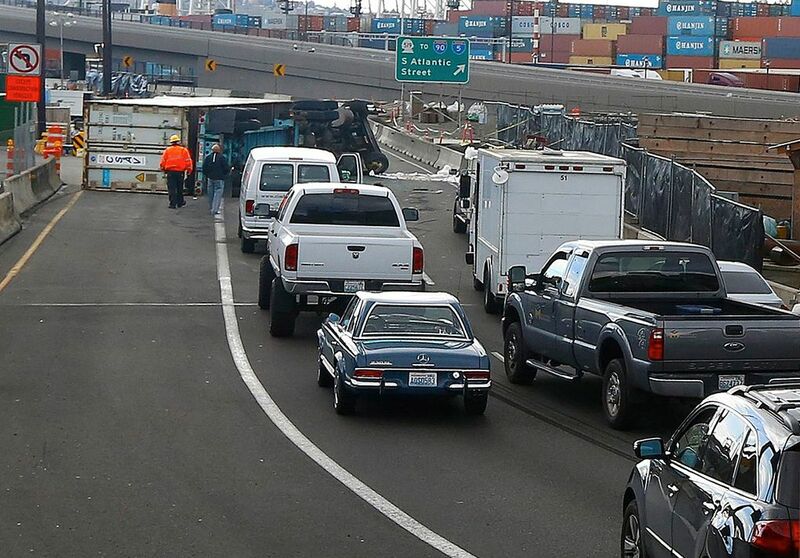 A semitruck carrying a load of salmon overturned and blocked all southbound lanes of the Alaskan Way Viaduct on Tuesday afternoon, causing rush-hour gridlock and hourslong commutes throughout the city. The truck crashed around 2:30 p.m. near Safeco Field, according to the Seattle Police Department, and the southbound lanes were closed until just before midnight. The driver was evaluated by Seattle Fire Department medics and taken to Harborview Medical Center with non-life-threatening injuries. The cause of the crash had not been determined Tuesday night. The blockage forced southbound motorists to exit Highway 99 at Denny Way, and the congestion soon spilled onto surface streets and all other southbound routes into the city. 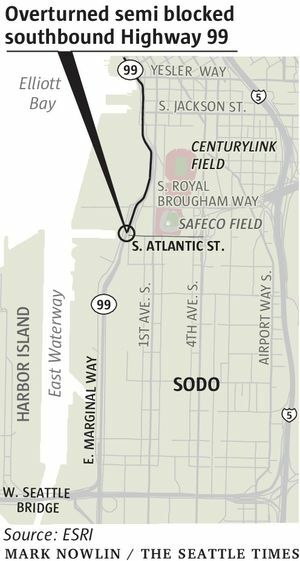 Around 5 p.m., the Seattle Department of Transportation reported an hourlong travel time on Mercer Street from Elliott Avenue to Interstate 5, a distance of less than two miles. Vehicle stalls and collisions on the Aurora Bridge, West Seattle Bridge and southbound I-5 further contributed to the bumper-to-bumper mess. The 7 p.m. kickoff scheduled for the Sounders game at CenturyLink Field was pushed to 7:23 p.m. because of traffic delays. King County Metro buses and Sound Transit express buses were delayed for up to 90 minutes. The semitruck was lifted back on its wheels around 7 p.m., Seattle transportation officials said. But the trailer’s contents shifted, making it too unstable to be towed, so crews detached the trailer from the truck and pulled it off the roadway. An hour later, contractors determined the trailer would need to be unloaded before it could be moved and that eventually a crane would be needed to get the trailer off the highway. By 9:30 p.m., crews had begun to unload the trailer. The sheer weight of the fish load made cleanup challenging, police spokesman Drew Fowler said. Fowler said he wasn’t sure if the fish were frozen or fresh when the truck overturned, but the Seattle transportation department confirmed the fish were salmon. Seattle police will investigate whether it will issue any citations, Fowler said. On social media, commuters updated their locations and recounted their commute times when they finally made it to their destination.